Freedom from dentures are just a few steps away with our mini-implants. No more loose fitting dentures, talk and chew how you like! Freedom from dentures. That is, freedom from the problems of poor fit and looseness; chew and talk how you would like to. We are really proud of the dentures we make, but they do have certain drawbacks….as good as dentures should be, mini implants can be a solution to some retention problems. This is a simple procedure, so please read on! Gum shrinkage becomes a major problem with full dentures; mini implants are excellent at helping the bone to resist this as they transmit forces in a more natural way. Because the implants are about the size of a standard wooden toothpick (they are made out of a titanium alloy), if there is not enough bone to accommodate standard implants then they can generally be fitted with minis. Finally, since the procedure is minimally invasive, there are very few contra-indications to the treatment. You will leave the practice with your teeth in. A. No one can guarantee how long any implant will last since so many of the factors that determine the longevity of these devices are patient specific. As stated, “permanent” is not really accurate, but “long term” is more more truthful when referring to any dental appliance. Some minis done in the mid 1970’s are still in function. Mini implants have been in common usage only since about the year 2000. The vast majority of MDI minis placed since that time are still functioning well. A small percentage of all implants will fail for various reasons; a failed mini implant is easily removed, and healing is generally complete. 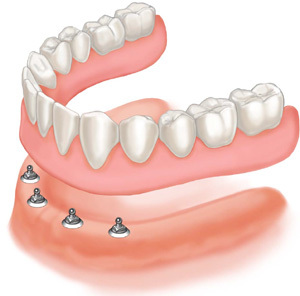 Another implant can usually be placed adjacent to the site of the failed implant immediately, or after waiting for three months, directly into the position formerly occupied by the failed implant. A. Implants do not have a natural “shock absorber” ligament like a normal tooth does, to reduce the effect of the constant forces that grinding and clenching will transmit to them. Clenching and grinding can place literally tons of pressure on the bone/implant interface. The constant “shocks” experienced at the bone/implant interface due to clenching and grinding cause micro fractures and crushing of bone at the interface and these will subsequently cause the body to recognize the implant as a foreign invader. Thus the body can reject the implant. A. Age or physical condition are not usually factors regarding the success of mini implants. The short surgery, low cost and minimal post-op discomfort, as well as the ability to function with the new implants immediately make this form of therapy ideal even for seniors with numerous physical ailments. The only common age related factors that may interfere with these cases are dementia and severe osteoporosis. Severe osteoporosis may affect the bone density and reduce the likelihood that the implants will be successfully retained. Dementia makes it difficult or impossible for the patient to cooperate during surgery, and may make it difficult for the patient to insert or remove the denture.